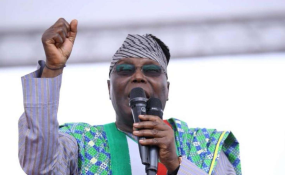 Abuja — Speaking to a thrilled huge crowd at the party's South-west rally, held in Ibadan Thursday, the presidential candidate of the Peoples Democratic Party (PDP), Alhaji Atiku Abubakar, promised to start the process of restructuring the country within six months of his administration, if voted into power. Atiku told the crowd of party faithful and supporters, "In the next two months you will be required to make history in this country. Since the return of democracy in 1999; the best prosperity we have enjoyed in this country was under the PDP. The best peace we have enjoyed in this country was under the PDP; the best educational advancement all parts of this country enjoyed was under the PDP." The presidential candidate said the progressive trend was aborted in 2015 when, as he put it, the All Progressives Congress (APC) lied its way to power, promising to secure the country, improve the economy and create jobs. Atiku said rather than keep these promises, the APC worsened the condition of Nigeria and its people. He said, "In 2015, some liars deceived you people; they came to deceive us and we believed in them; we gave them the opportunity. They said they were going to create jobs, instead of creating jobs we have lost about 12 million jobs since they came to power. "They said they were going to create prosperity, but since they came, we have gotten poorer to the extent that today we have surpassed any country in the world in terms of poverty; we are the headquarters of poverty in the world. Is that the kind of government you want to continue with? "My brothers and sisters I stand before you today to promise you that we shall return your prosperity and the prosperity of this country. If you give me the opportunity again, I will assemble the best team so that we can return prosperity to our country." The former vice-president said the South-west has been known for its educational strides before independence, and promised to continue to invest in education to make sure that the zone excels. On restructuring, Atiku promised, "Let me tell you one of the most important policies I have advocated for in this country is restructuring. Today I stand before you to pledge that within six months, we shall start the process of reconstructing this country." Also speaking at the rally, the Director General of the PDP Presidential Campaign Council and Senate President, Dr. Bukola Saraki, said that the only way for Nigerians to end this excruciating suffering is to vote out APC-led federal government. According to him, "The suffering is too much. The only way we can stop this suffering is to come out on the Election Day and vote Atiku." The former governor of Ekiti State and the South-west coordinator of PDP presidential campaign, Mr. Ayodele Fayose, urged the citizens to protect their votes during the election in 2019. He said, "The only product we are selling is Atiku. PDP and Atiku; that is the product, the product that will come forward and participate in the debate, because I can tell you authoritatively that Buhari will not come. "Therefore, we must stand together because this election is won already. We are only to protect our votes and stand up for the PDP. It will happen and PDP will be announced again." On his part, the National Chairman of the party, Prince Uche Secondus, said that APC is afraid of Atiku because he is the only man who can rescue Nigeria from its current crisis. He said, "APC took over in 2015; what did they come with? They came with hunger, they came with insecurities, people are being killed every day in Nigeria; the president is not aware. If they kill people in Benue, he's not aware, if there's hunger in Oyo, he is not aware. He is not aware of anything. The economy collapsed he said he is not aware." Similarly, a former National Secretary of PDP and member of the Party's Presidential Campaign Council, Prof. Wale Oladipo, assured the presidential candidate of massive votes in the South-west. Oladipo, in a statement yesterday said Atiku's experience as a vice president to former President Olusegun Obasanjo, coupled with his private sector experience would be an advantage in running an all-inclusive and liberal government after winning the 2019 election. He stated, "I commend the good work of members of the National Working Committee (NWC) of our party in their efforts to make the Party regain its lost glory and I will also want the body, the Board of Trustees (BOT) and other prominent leaders of the party to ensure a total reconciliation in the Zone and others in general in order for it to make a successful outing in all the 2019 general elections."